Once you start talking like that you will hear the most limey of phrases. "Are you taking the piss?" I don't know why but this happens to me all the time, be it in English, Mandarin, or even my own Chinese dialect, Hokkien! Haha! I'm French-from-France, and the same thing happens to me each time I meet a francophone Canadian. I's embarrassing, I'm always afraid the other person will think I'm laughing at them. Ah same thing happens to me when I speak Beijing Accented Mandarin and another person is speaking Taiwanese accented mandarin. But strangely also happens to me she speaking English with a British person too. I'm really curious onto why this happens. I spend my time with non-natiive English speakers, and feel my English is affected, though more grammatically than phonetically. I usually say [et] for ate, but lately been slipping into [ejt]; sometimes I take photos to things rather than of things (hispanophone influence); and now I realise that "locked" is loosing footing in my vocab and "closed" is slowly replacing it (but this annoys me because I don't consider it its "proper" use, lol). My wife is Italian and I do the exact same thing - adopting her grammar and curious expressions, because it's easier. I know she'll understand me. Really bizarre! Look into Communication Accommodation Theory (https://www.wikiwand.com/en/Communication_accommodation_theory). Basically, the idea is that we want to be socially accepted, so two interlocutors will automatically shift their speech patterns toward each other. If their accents and languages aren't too far apart, it's entirely possible for both speakers to be using a speech style that is a mix of the two speech styles. My speech has some extreme examples of this. When I'm in my hometown, I have a full-blown local accent, but whenever I was at my college speaking with a professor or something, I'd usually be using a pretty close approximation of Standard American English. However, when I would speak with professors who were from the area I grew up, both of us would have an accent that was somewhere between pretty standard academic American English and our region accent. It's actually spelled 'Inglin'. And all the Mericans I know say 'flat' and other British words now. You're welcome. Reminds me of when I hear Brits that have been living in the US, you can always hear some influence, like that Robert bloke in Restaurant Impossible. Me [Canadian accent] : That Biology project took all night. Other [Texan accent] : I know! I'm exhausted. Me [Canadxan] : We can get coffee after this class, that'll help. Other [Texan] : Sorry, but I can't. Gotta do our Physics thing, it's due Friday. Me [Canexan] : Aw yeah, I forgot about that. How's your thing coming along? Other [Texan] : It's all right, I guess. We should've really finished it last week. What about yours? Me [Texan] : No, no please. I don't wanna talk about it, haha. Other [Texan] : Y'all feeling okay? Your accent just... switched. Me [hastily back to Canadian] : Oh, I'm so sorry. That happens sometimes. Other [Texan] : -.- Mhm. Okay. Ah yes, the joys of being educated in a British school, moving to Canada, spending months in Texas, and (coming this fall as the story to end all stories) moving to Scotland for university. I think in 5 years when I'm done with school, I'm going to have a Canadian accent. I'm interested to know the inspiration behind this story... over here, Americans are usually mercilessly ribbed about being 'so' American when they visit, e.g. ; 'Hey, I'm from the states! Can you tell? I'm from Montana / Idaho / insert here'. It also got me thinking about accents, because that is a Union Jack (not the English flag :) ), but I'm betting it's not a Glaswegian / Highlands / Geordie / Lancashire / Scouse / Yorkshire / Barnsley / Brummie / Cornish / Welsh accent, and I always wonder how big the differences are in places like Germany (I know you touched on it with Swiss German) & Italy. When my granddad did national service in Germany he only knew a handful of words but once, when he tried to ask for eggs up near the Danish border, the shopkeeper couldn't understand the accent he'd been taught in Dusseldorf. The inspiration doesn't come from this literally having happened - truth be told, I actually wanted to do a comic about how when I speak English with Germans, I sometimes slip into a German accent, but I couldn't figure out how to get it across visually. 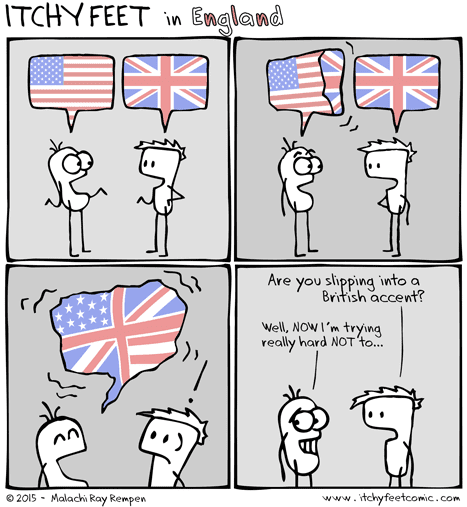 I do know someone who slips into an Irish accent when speaking with Irish people, and I sometimes use English slang and occasionally will say things in an American's-idea-of-a-British-way when speaking to my English friends, but not quite as bad as in the comic. I know it's the UK flag and not the English flag, but I routinely use it as the visual for the English language so I figured it would be appropriate for the all-around "British" accent...the thought did cross my mind to use the English flag but then I'd be stating that it was specifically THAT accent, NOT Glaswegian/Lancashire/Yorkshire/Cornish/etc/etc/etc accent, which I didn't want. Plus it's more universally recognized as "English" even if that's not true. In Germany there's quite a bit of difference, you're right on. If someone from Munich talks to someone from Hamburg they're not going to have any trouble, but if a bumpkin from Bavaria talks to a fisherman from Mecklenburg, they will probably walk away scratching their heads, even if they're speaking High German. Cheers Malachi, I like that you take the time to answer. I don't suppose you've seen the videos of Steve McClaren speaking English in a Dutch accent on Dutch TV, or Joey Barton with a French twang? They're pretty funny. And I hope I didn't sound critical about the flag, I know that you know... it was just the easiest way to lead into my accents question. The comic would look pretty dumb if you qualified everything. I like that you took the time to ask! And critical is good, I'm constantly looking to improve how to communicate these ideas visually. So cheers! Love this comic! Happens to me even in the US like when I visit my sis in Boston. I have a friend who gets a Southern accent for a bit after watching "Sweet Home Alabama" too. My god, this is me. I read somewhere that the "american" accent was the one the British used to speak, too, and England gradually (consciously) changed its accent after the US Independence. Do any of the native speakers have any idea about this? I remember reading that as well...I think it's not quite so simple, more the fact that 200 years ago, the British spoke with a much different accent than the one they speak today, and the American accent evolved one way, where the British one continued evolving another way. I don't know if it's a legitimate site or not, though. Unfortunately for me, I pick up words, accents, grammar and slang from everywhere: movies (mostly English), tourists (different languages), travelling to different parts of my small country (Greek idioms/ dialects), even if it is short-term. It wears off, but not completely. Does everyone mix languages they barely know or should I just cry in the corner? Everyone mixes languages, I think, but just to be safe, you should still cry in the corner. It's not exactly that Britons used to speak with what is now the American accent, it's just that General American has evolved differently than Received Pronunciation has. This is why (apparently) certain rhymes in Shakespeare's works are heard better in an American accent than a British accent. It's not that Shakespeare was speaking with what is now an American accent, it's that those particular vowels haven't really changed too much in American English, but they have shifted in British English. If you check out the Great Vowel Shift (https://www.wikiwand.com/en/Great_Vowel_Shift), you'll notice that if you look at words that continued to change from the 1700s onward on the chart, a lot of those words are pronounced (at least slightly( differently in American and British English. I usually try to do this just to try to hide being American. ..I'm terribly self-conscious about it.